Orchard Windows Gallery is pleased to present “I’m Having Trouble Cutting this Ballerina“ a solo exhibition by artist Jamie Martinez. 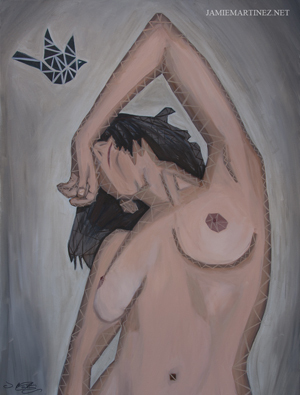 The painting technique utilized by Martinez is called Triangulism. This method deconstructs an image by using geometric triangles, and by process of elimination, only the core triangles are left to show the image’s true meaning, form and struc– ture. The beauty and contrast that a ballerina gives is unmatched, and as a figurative painter, Martinez found inspiration for this series in the dancer’s form. Visual artist, Jamie Martinez, moved to Florida at the age of 12 from his hometown of Cali, Colombia. After attending Miami International University of Art and Design and receiving the prestigious Hispanic Designer‘s scholarship, he moved to New York to pursue his Bachelor‘s degree (F.I.T. ), and to follow his dream in the Visual Arts. Not one to follow others, Jamie’s work clearly expresses his exceptional view at life and art. He has shown all over New York City, Miami and recently in Canada. Jamie Martinez currently resides and works in Manhattan, and is represented by Orchard Windows Gallery in NYC.